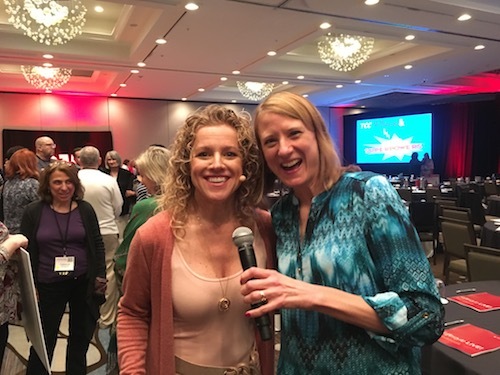 Today we welcome guest blogger Michele PW (Pariza Wacek) to share a few golden nuggets she experienced at my recent Lifestyle LIVE! event. Take it away Michele! Have you ever heard Melinda Cohan talk about how she assumes the yes? During her recent first-ever live event, “Lifestyle LIVE,” she taught a segment about how she assumes the yes in enrollment conversations, and why doing the same can be a powerful shift for you. So, what might “assuming the yes” look like for you? Well, to start, it doesn’t look like you’re ATTACHED to the yes. You’re not pursuing the prospect, or trying to twist her arm, or saying anything to get her to plunk down her money. You’re assuming the yes; you’re not attached to it. For Melinda, it looks like this: she comes to the enrollment conversation prepared. She uses The Coaches Console (what else?) to prepare the contract so when the prospect says “yes,” she can pull it up and walk that person through it herself, right then and there. One of the reasons this concept is so powerful is because you may actually be unconsciously repelling your prospect, if you’re not prepared to welcome him into your business. Plus, if you’re not a full-body, 100% yes to accepting new clients, how comfortable do you think your prospects are going to feel in the enrollment conversation? I was profoundly affected, when I first heard Melinda teach this concept. Why? Well, have you ever heard of the Enneagram? If so, you know it’s a way to identify your patterns around your wounds. That’s a useful tool, if you want to break the negative cycles you find yourself stuck in. So, I’m an Enneagram 6, which means I’m a worrier (and I’m talking massive here, folks). If you know anything about me, that will strike you as a bit ironic … because my entire business has shifted to a love-based foundation, instead of fear-based. The Enneagram changed everything for me, because now, when fear or worry or anxiety comes up for me, I’m able to feel and process those emotions by breaking the pattern and getting out of it quickly. To me, assuming the yes, means I’m not waiting for the other shoe to drop, and that can be problematic for me. You see, along with my worry habit came the realization that I had created a false “story” about my worry—I allowed it to be a sort of “magical talisman” to keep me safe. So, in my mind, if I started assuming the yes, I would have to take cover from all the dropping shoes! Are you assuming the yes or the no, in your enrollment conversations? If you’re assuming the no, why? Are your fears getting the best of you? The fear of “jinxing” yourself? Of the disappointment that comes with the no, if you’re expecting the yes? Whatever it is, I invite you to flip your perspective. What would happen if you assumed the yes instead? Good reminder that our expectation should be that our message will be accepted. In puts you at ease which is felt by the listener. It’s the positive attitude without ‘negative’ attachments lurking in the background. I’d add that even when you get a no reply, it’s okay. Someone else is waiting to say yes.